Home | Practice Areas | Social Security | How Long Are You Eligible for Disability Benefits? You could keep your Social Security disability benefits for your working life until you retire. At retirement age, you would then start receiving Social Security retirement income or Supplemental Security Income (SSI) for the elderly. Since Social Security disability benefits are designed to help pay for income when you cannot work due to a disability, you can keep receiving these benefits as long as you have a disability preventing you from working. Periodically, you may have to get a Continuing Disability Review (CDR) to determine whether you still qualify for benefits. You will be told when you need to get a CDR. In most cases, it will occur every three to seven years, although sometimes it may be requested more often. What Is the Likelihood That I Get a CDR? What Are the Reasons That the SSA Might Stop Your Benefits? What Should I Do If I Get a CDR Letter? What Should I Know About Doing the Short Form CDR? What Should I Know About the Long Form CDR? How Will the SSA Evaluate My CDR? What Should I Do If My Benefits Are Stopped After Receiving a CDR? The likelihood of getting a CDR request is dependent on how much the Social Security Administration (SSA) believes that your medical condition could improve. If the SSA believes that you are expected to improve medically, it will review your claim in six to 18 months after your benefits have been awarded. If the SSA believes that medical recovery is possible, it is likely to review your case at least once every three years. If the SSA believes that medical recovery is probably not going to happen, it will probably only review your claim every five to seven years. Other situations that could lead to a CDR include completing a vocational rehabilitation program. If you get a CDR request, do not panic. Most people are not awarded Social Security Disability Insurance (SSDI) benefits or SSI benefits unless they have already made a compelling case that they are eligible for such benefits. 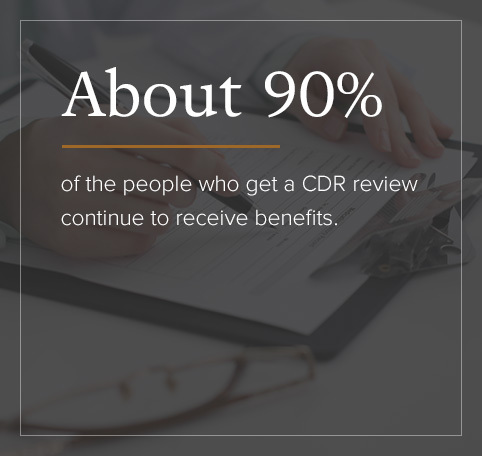 About 90 percent of the people who get a CDR review continue to receive benefits. If you want to make sure you are not one of the 10 percent whose benefits are dismissed or denied after CDR, you can do several things to encourage a successful review. If a CDR shows your medical condition has improved to the point it impacts your Social Security disability eligibility, you could see an end to your benefits if your improvement allows you to return to work. However, this is generally rare since the qualification for benefits is strict and only granted in cases which improvement is unlikely. If you can work and earn more than the Substantial Gainful Activity (SGA) — defined as $1,220 per month for 2019 or slightly more for those who are blind — this can impact your ability to get benefits. The first thing that you should do is open the letter and read it. Never put aside any communications from the SSA thinking you will get to that later. The SSA will only send you communications if it is about something important. If you miss a deadline because you wanted to “get to it later,” it could lead to your benefits being denied. Make sure you respond in a timely manner to the request for information from the SSA. If you know you are going to have trouble responding on time, you should contact the SSA immediately and request more time. As part of the CDR, the SSA will ask you to submit documentation and evidence that supports the diagnosis of your ongoing disability. Always keep copies of all the documentation and forms you sent to the SSA either during your initial claim or during an appeal, so you can find the information that you need quickly and make it that much easier to complete a CDR. It is also a good idea to keep copies of all your documentation because the SSA has been known to lose paperwork. Along with supporting documentation, the SSA will ask you to do either a short or a long form CDR. If you do not do the forms, it is likely that your benefits will be denied. Receiving a short form CDR is usually a good sign. It means that the SSA believes that you have a low chance of seeing any noticeable improvement in your disability. This form will actually be read by a computer. If the computer spots any “red flags,” it will be sent to a person for review. Provide truthful answers to all the questions on the form. The answers to some questions can trigger a human review. If your doctor has told you that you have improved enough medically to start to work again, and you answer that your health is better, or if you say that you have received no medical treatment for your disability since your benefits were awarded, it is very likely that your two-page review will be examined more in depth. If your doctor has told you that you can probably start to work again, request a complete list of any physical or mental workplace restrictions. Make sure you include these when you return the form. You might want to think about having people who know about your disability provide statements where they can give examples of how your disability has prevented you from working. If information like your telephone number or your mailing address are different from what you see on the form, you need to send the SSA a written request to update this contact information. If you have developed new medical limitations very similar to the disabilities you outlined in your initial application or during your appeals hearing, make sure you note that in the remarks section of the form, particularly if you feel they are related to your original disability. Make sure you respond to this CDR in a timely fashion. If you need more time to gather more medical information, you need to request it as soon as possible. If you receive a 10-page CDR, it will be reviewed by an SSA employee instead of a computer. Follow the same guidelines that were outlined in the shorter form. The long form will request that you provide the name of a person who is familiar with your disabilities and how it affects your ability to find work or do a job. Give detailed descriptions about the medical conditions that affect your ability to work, mentally and physically. Include information about your medical condition when you first applied for disability benefits and how it may have changed in any way. You need to report any work that you may have done since your disability benefits were awarded. Even if you only performed the odd job now and then, make sure that is in the report. Note any special assistance that your employer may have provided and give accurate reports about the number of hours worked, what your duties were and how much you earned. If you had to stop working or reduce the number of hours you worked because of your disability, include those details in the answer. Inform your doctor that the SSA is doing a CDR and that the SSA may contact them for additional information. The 10-page form will want to know if you experience any difficulty with what the SSA considers “normal daily activities.” Answer these questions accurately and give details about the activities with which you need assistance. Again, answer all the questions on the form truthfully and contact your local SSA office to make sure they have all of your documentation, forms and needed medical records. Remember, the SSA can sometimes lose paperwork. It is in your best interest to check to see they have what they need. Once the SSA has received your CDR, it will first try to determine if your medical condition has improved. If they believe nothing has changed, the review is over and your benefits will continue. If they do believe that your medical condition has improved, the SSA will then try to determine if the improvement in your medical condition has any effect on your ability to perform a job. If the SSA does not believe that it affects your chances of finding a job, the review is finished and your benefits will continue. If the medical evidence that you have submitted is not enough for the SSA to decide on your ability to work, or if they find discrepancies between what you have reported and the medical evidence you have presented, the SSA could send you to receive a consultative exam from an SSA doctor. If the SSA determines that your condition has improved enough to allow you to return to work, it will notify you that your benefits will be stopped. Normally your benefits will continue for a month or two after the SSA makes this decision. The SSA will also inform you how you can appeal this decision. First, we want to remind you that relatively few SSDI benefits or SSI benefits recipients have their benefit stopped after CDR. Roughly nine in 10 people will continue to receive benefits. If your benefits are stopped, however, it is important to carefully study the notice you receive that explains why your benefits are being stopped. Finding out why your benefits were stopped is one of the first steps to having them restored. The most common reason that the SSA halts SSDI benefits, as noted above, is because the claimant has returned to work and has achieved a level of SGA which means they can no longer receive SSDI benefits. In 2018, the SSDI benefits cut off level was $1,025 a month. In 2019, the SSDI financial cut off level will be $1,220. For example, say you are earning $225 a week in a part-time job in 2019. Technically you are below the SGA level and would normally continue to receive benefits. If you are doing a lot of work, however, and earning this money on a regular basis, the SSA could determine that your work fulfills the SGA requirement, and your benefits could end. Making too much income or acquiring too many assets is also the most common reason that the SSA terminates SSDI benefits. Other reasons that your SSDI benefits might end include reaching retirement age or being institutionalized or incarcerated. SSDI benefits end when a person begins to receive Social Security retirement benefits. If you are incarcerated or institutionalized, your benefits will be stopped during that period and not reinstated until a month after you have been released. If you have been notified that your benefits will end after a CDR, and you feel you have not been treated fairly and your benefits should continue, you need to appeal the decision within 60 days of receiving your notice. You need to file a Request for Reconsideration. If, however, you want the SSA to continue your benefits during the appeals process, file this request within 10 days of receiving your denial and ask to have your benefits continue while you are appealing the decision. If this request is denied, you can request that an Administrative Law Judge (ALJ) hear your appeal. If the ALJ denies your claim, you can ask for a review by the Appeals Council. If the Appeals Council turns down your claim to have your benefits reinstated, your benefits will stop. You can still, however, file a lawsuit with the federal court. As you can see, if the SSA stops your benefits because of a negative CDR, it is important that you begin the appeals process as soon as possible. A KBG Injury Law attorney familiar with how Social Security benefits work can help you with your case. We understand how confusing and time-consuming preparing an appeal to a CDR can be and the emotional and financial strain it can take on your family. Once you are approved for disability benefits, it is unlikely they will be cut off. In the event this happens, however, contact KBG Injury Law immediately for a consultation to find out how to appeal your case and start getting your rightful benefits back. You can call us at 1-800-509-1011 or visit our contact us page where you can leave us your contact information and some details about your case. A member of our team will get back to you as soon as possible.